This light-hearted series, which ran from 1977 to 1987, took place aboard the Princess Cruise line and featured a variety of stories each week, guest-starring celebrities of the day, as well as classic movie stars and upcoming actors. 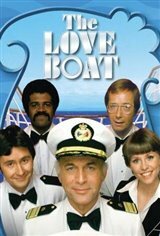 Series regulars included Gavin MacLeod as Captain Stubing, Bernie Kopell as Dr. Adam Bricker, Fred Grandy as Purser "Gopher" Smith, Lauren Tewes as Cruise Director Julie McCoy and Ted Lange as Isaac Washington. The cast was joined in 1978 by 12-year-old Jill Whelan in the role of Vicki Stubing, the daughter of Capt. Stubing. Guest stars on The Love Boat included celebrities such as Carol Channing, Milton Berle, Ethel Mermen, Sonny Bono, David Cassidy, Betty White, Jane Wyatt, Patty Duke, Lorne Greene, Eva Gabor, Ben Vereen and many more. Each episode had a minimum of three stories that found passengers falling in love or renewing relationships. The stories sometimes intertwined, or as more often was the case, stood alone, and mostly all had happy endings. Each episode was also filmed in part aboard a ship from the Princess Cruise line.